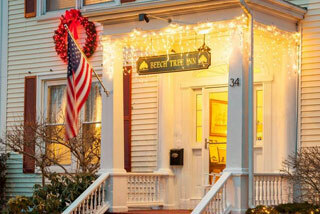 The Architect’s Inn - George Champlin Mason House was constructed in 1873 as the palatial, private residence of George C. Mason, the famous Newport architect. 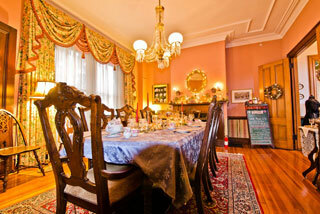 This original 23-room Victorian mansion offers graciously appointed historic rooms. The Top of the Hill location is the best location in Newport for the beach-goer to the average mansion tourist to the romantics. Newport has so much to offer as the New World's original beach resort town and more recently became famous for having the world's largest number of historic architectural buildings in one town. Perfectly located in quiet "Historic Hill" and a short walk to Newport's fabulous restaurants, boutique shopping, and ocean beach, you are welcomed in a comfortable living room with fireplace and then afforded the added convenience of a common area complete with an equipped kitchen, refrigerator, and ice machine. Many rooms feature a fireplace and Jacuzzi tub for extra luxury. The garden and rooftop decks allow you to soak up the sun, daydream quietly, or chat with a bottle of wine. "Famous for our warmth & hospitality" you will wake to a scrumptious full breakfast.